Art! | Robert Mitchell Jr. This is called “art!” For my first large, graffiti-style piece, it doesn’t stink too bad. It would’ve been much better if the white paint can hadn’t clogged. Bummer. Normally I spend Sunday mornings writing blog posts for the week. Not today. I decided to make art. I often draw and paint (acrylics mostly), but I’ve always wanted to try my hand with spray paints. You know, graffiti-style. So I did. Unfortunately the only can of white paint I had around the house got clogged. I didn’t bother to run to the store for a new can. This was supposed to be quick, spontaneous, and fun, not some major project. It ain’t perfect, but it is what it was supposed to be. Making the video and writing this post took longer than making the piece. And it was a blast. If you want to watch me paint it, I’ve included the video below. 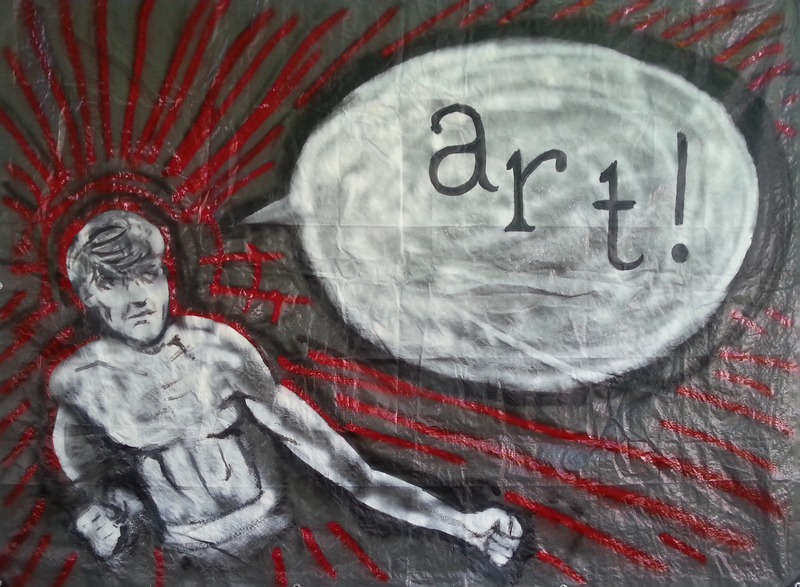 This entry was posted in Martial arts, Mysticism, Writing and tagged art, graffiti. Bookmark the permalink.